Prophet Muhammad, Allah’s Prayers and Peace be upon him, said, “Allah had been existing and there had been nothing with Him; His Throne had been on water, and He wrote everything in the Scribe and created heavens and earth.”, he also said, “When Allah created everything, He wrote in His Book which is on His Throne ‘My Mercy precedes My Wrath’.”; his companions accepted what he saidwithout ever trying to engage their minds in thinking how, why, where, orwhen. Their main concern was mostly dedicated to the knowledge of the commandsand prohibitions of Allah so that they may follow His Commands andavoid doing what He forbids, in order to gain His Reward and avoid His Angerand His Wrath. They applied to their lives what they comprehended, as forwhat they did not comprehend they believed in. That was their attitude towardsthe Qur’an in matters that are not related to orders or duties, as for instancestories of the former nations, hidden and invisible things, as the Qur’anis the last of all the holy books and it had been sent for them and for thosewho will succeed them, for us and for those who will be after us until Doomsday. Undoubtedly, man knows more day by day, sciences develop and progress, discoveries augment increasing our knowledge and opening more gates of enlightenment specially the cosmic and universal signs; thereupon, there are those, such as the Companions of the Prophet, Allah’s Prayers and Peace be upon him, to whom it was said, “Do they not look at the camels, how they are made?” (GASHIYA, 17); they, and those who succeed them, learn and take a warningfrom these verses. There is also what is said to those who succeed themand us, such as, “And the sun runs his course for a period determinedfor him, that is the decree of Him, the Exalted in Might, the All-Knowing(YA-SIN, 38). The Companions understood that what was meant was the course of the sun from the east to the west which is observable by eyesight. Their successors discovered that what really moves is the earth and not the sun,so they say that the Quranic verses included what was visible and apparentto their eyes so Allah, Praise and Glory be to Him, addressed themaccording to what they see. Then they were followed by a group of people who said that the statement is true because the sun actually moves pulling all the solar system to a place known only to Allah; only He, Glory be to Him, knows what will be discovered later on. This is the case with matters concerning observations of the human being. How would the case be if we try to contemplate the Exalted Self which we are forbidden to do according to the Hadith: “Contemplate the attributes and the epithets of Allah and do not ever contemplateHis Exalted Self so that you may not be led astray”. Undoubtedly, contemplating what we are not allowed to contemplate is detrimental to our faculties, and a blight to the Faith of the believer. Allah, Praise and Glory be to Him, created us for a certain aim and assigned to us certain duties and assignments that we must undertake; the aim of our creation is hidden from us whereas the duties and the assignments are perfectly and fully revealed to us; so we should not occupy ourselves in contemplating the aim of creation and ignore our duties and assignments that Allah, Praise and Glory be to Him, ordained us to do. We should contemplate the effects of the attributes and not the essence and secrets of it. We must consider the impact of the expressions as meanings and mere denotations; as for their real essence, only Allah, the Lord of these attributes knows them. For instance, from the Hadith:“My Mercy precedes and supersedes My Wrath”, we gain theinformation that Allah’s Mercy has the precedence and that it isancient; His Attributes are ancient, and the ancient is what was never precededby anything. In the Hadith, it is evident that Allah’s Wrath is precededby His Mercy; it has been said that this means that His Wrath is not ancient,and what is not ancient should not be an Attribute of Allah, Praiseand Glory be to Him. It has been mentioned in the Hadith that “Charityextinguishes wrath”, and as Allah’s epithets cannot be extinguishedbecause they are eternal, we deduce that we should not attribute to Allah what He did not attribute to Himself. The Divine Acts that are related to the Divine Will and Omnipotence remain as they are and should never be interpreted, for Allah, Glory be to Him, is the Lord and the Doer of all that He intends. Furthermore, we should not ask (why) or (how) with respect to the Divine Acts of Allah or with respect to the duties Allah had charged mankind with, for Allah, Praise and Glory be to Him, had ordained what He pleases to differentiate between the obedient and the disobedient. There are examples set in the Qur’an about requests we should not even contemplate; these examples were set forth as a warning and to teach us what to accept without questioning, as Allah, Glory be to Him, says, “There is, in their stories, instruction for men endued with understanding” (YUSUF, 111). The first example is the request of Moses as mentioned in, “O my Lord! Show Thyself to me, that I may look upon Thee. God said, ‘By no means canst thou see Me direct; but look upon the mount; if it abide in its place, then shalt thou see Me. When his Lord manifested His Glory on the mount, He made it as dust, and Moses fell down in a swoon. When he recovered his senses he said, Glory be to Thee! To Thee I turn in repentance, andI am the first to believe” (A’RAF, 143). But of what did Moses repent? He repented of asking that request as Noah had repented before him where he said, “O my Lord! I doseek refuge with Thee, lest I asked Thee for that of which I have no knowledge”. 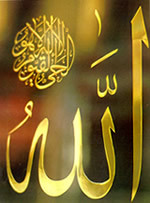 We understand from the request of Moses that Allah can never be perceived by vision but His Grasp is over all vision; we also understand that seeing Allah is not impossible because the condition was apossibility and therefore, seeing Him is possible if the mountain stayedfirm in its place which is possible if Allah willed it. In thisworld vision will perish, and what is perishable can not see the Everlasting;in the hereafter the believers are endued with an immortal body, eternalbliss and an eternal sight to be enabled to see, the Everlasting with theireverlasting vision, “Some faces that Day, will beam in brightness andbeauty. Looking towards their Lord” (QIYAMA, 22, 23).The manner and the modality of seeing Allah does not concern us, yetwe ask Him to endow us with the bliss of seeing Him on Doomsday, so we shoulddo the righteous deeds to gain this bliss. The second example is the request of ‘Uzair as mentioned in the Qur’an, “Or take the similitude of one who passed by a hamlet, all in ruins to its roofs. He said, ‘Oh! how shall God bring it ever to life after its death?’ But God caused him to die for a hundred years, then raisedhim up again. He said, ‘How long didst thou tarry thus?’ He said, ‘Perhapsa day or part of a day.’ He said, ‘Nay, thou hast tarried thus a hundredyears; but look at thy food and thy drink; they show no signs of age; andlook at thy donkey, and that We may make of thee a sign unto the people,look further at the bones, how We bring them together and clothe them withflesh.’ When this was shown clearly to him, he said, ‘I know that God hathpower over all things’.” (BAQARA, 259). The story here is a warning example, and ‘Uzair was an apostleand a believer who didn’t ask except when he was permitted to ask; thisquestion, which was asked by an apostle, was not answered, and neitherwould ours be if we asked. The third example is Abraham’s request as mentioned in the Qur’an, “Behold! Abraham said, ‘My Lord! Show me how Thou givest life to the dead?’ He said: ‘Dost thou not then believe?’ He said, ‘Yea! but to satisfy my own understanding.’ He said, ‘Take four birds; tame them toturn to thee; put a portion of them on every hill, and call to them, theywill come to thee flying with speed. Then know that God is Exalted inPower, Wise.” (BAQARA, 260). This denotes that what Allah has in His Power is inaccessible to anyone, and that this request was unattainable, yet Allah made the birds come to Abraham before he completed his call to them, and this is how the resurrection of the dead will happen; Allah says, “..then when He calls you, by a single call, from the earth, behold, ye straightway come forth” (RUM, 25). As in the case of Bilqis with Solomon and the story of her throne, “Said one who had knowledge of the book ‘I will bring it to thee withinthe twinkling of an eye!’ Then when Solomon saw it placed firmly beforehim, he said: ‘This is by the grace of my Lord! to test me whether I amgrateful or ungrateful!’ ” (NAML, 40). A miracleis achieved here as Allah gave him the ability to use (Be! and it is! ); so we get an idea about the laws of nature and how they could be made ineffective, or effective with respect to certain objects whileineffective with respect to others; for example, the food that remainedintact, the donkey that Allah took the life of then restored itback, and how ‘Uzair was not affected by death? Therefore, some laws ofnature prevailed and some laws were ordained by Allah, the Creatorof these rules, to be suspended; these are different laws of nature occurringat the same time and at the same place. We co-exist in this world with theeffects which Allah linked to the causes, but in Paradise causes willbe eliminated, leaving the effects to remain alone. Hence, we should notuse the relative pronouns (where, when, how, why) with respect to Allah. It is Allah Who accomplishes what He wills and nothing occurs in His Kingdom except what He wills, Praise and Glory be to Him, He is Allah.